*Does not support to the “Comments” in the current version. Please tap the “Log in” button after entering all the items. 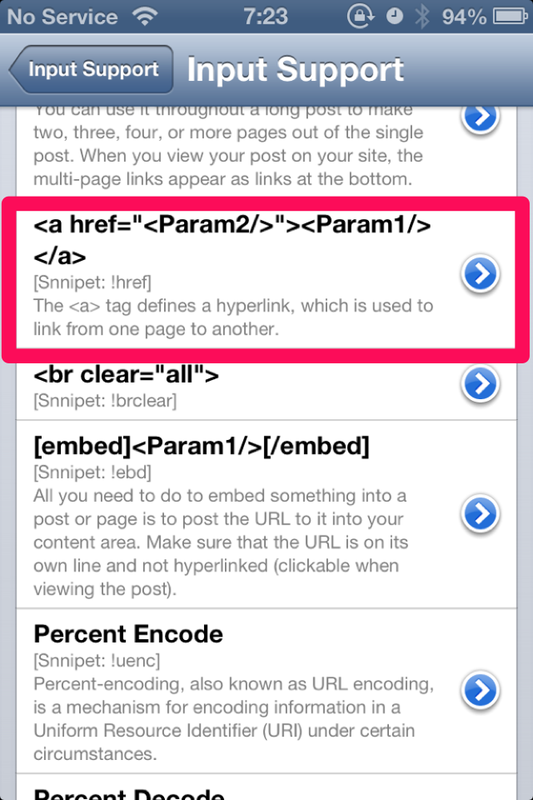 ※ PressSync determines the AppEndPoint based on the “Blog URL”. If the full URI of xmrpc.php has been entered, it will be treated as AppEndPoint. PressSync consists of tabs of “Published”, “Draft”, “Local”, and “Media”. The entries published is displayed on “Published” tab. Appears in the “Draft” tab entry otherwise. 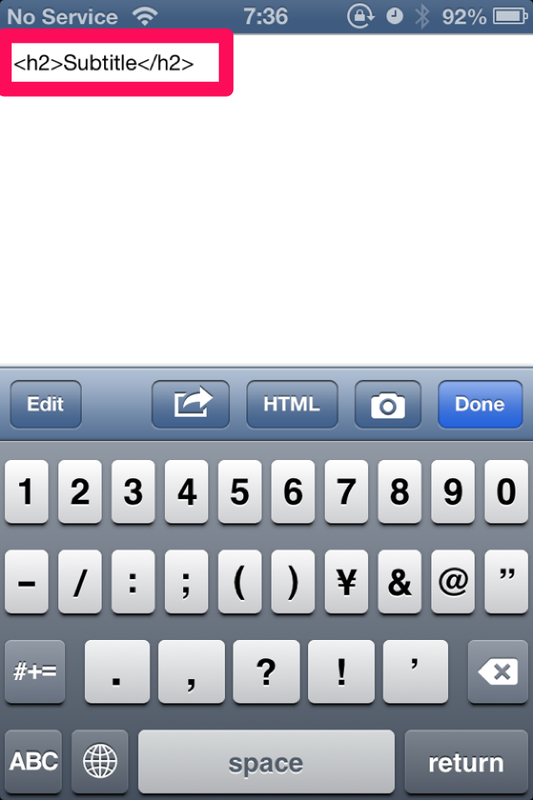 The entry saved at the iOS device is displayed on “Local” tab. WordPress media will be displayed on “Media” tab. 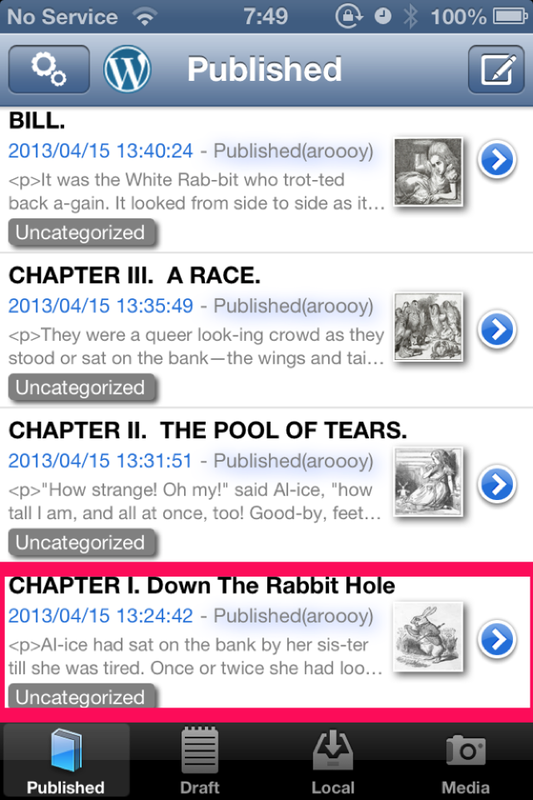 To refresh the display contents of the “Published”, “Draft”, “Media”. The contents of the list is up to date and do a pull-down in each tab. ※ I called the pull-down refresh this operation later. 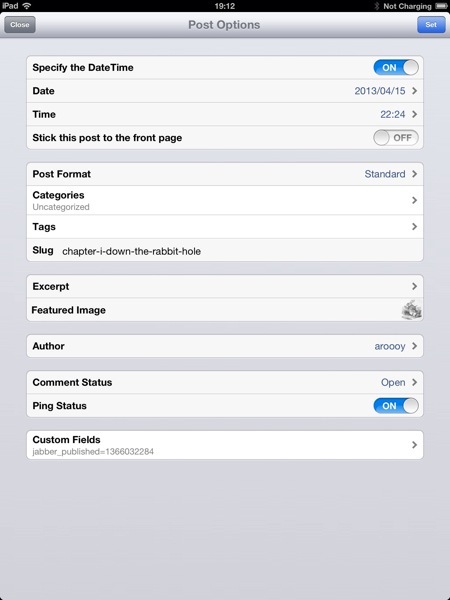 “Edit Post” Tap to launch any cell in the “Published”, “Draft”. “Media Viewer” Tap to launch any cell in the “Media”. Action sheet appears when you tap the accessory button on the far right in the cell. 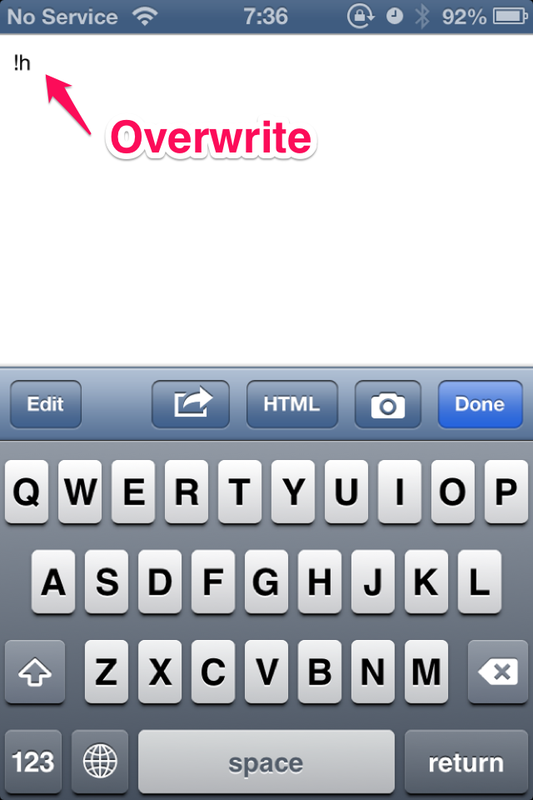 “New Post” is activated when you tap the pencil button in the upper right corner of the “local”, “draft”, “published”. 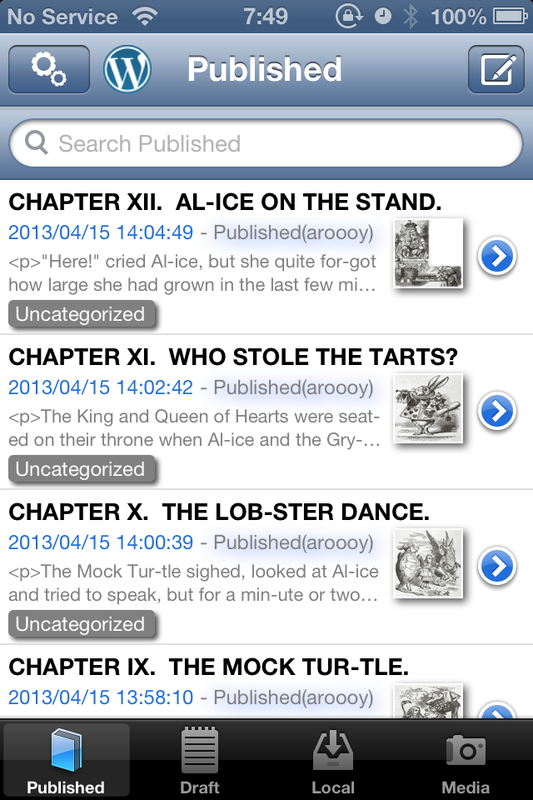 “Edit Post” Tap to launch any cell in the “Published”, “Draft”, “Local”. 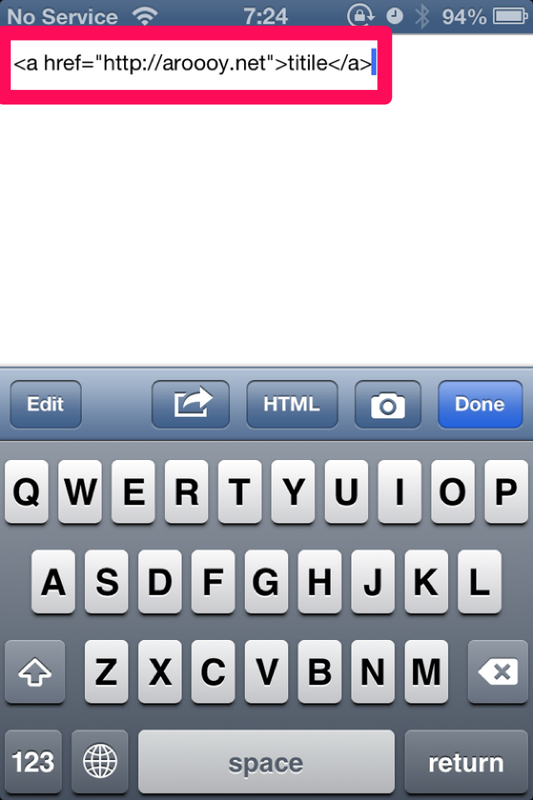 Tap the “Save” button to do any input title and body text box. 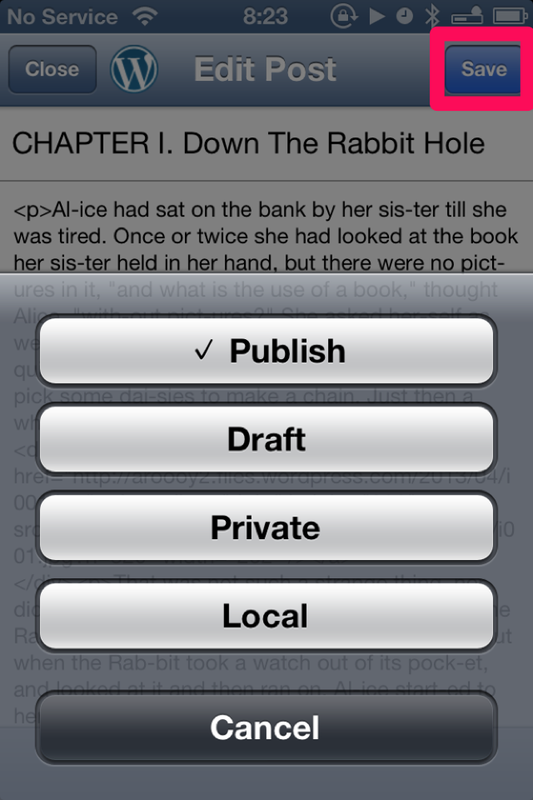 Please select one of the “Publish”, “Draft”, “Private”, “Local”, “Cancel”. Tap the button “Post options” at the bottom left of the screen. Tap the “Set” button to enter each item. Please tap if you want to cancel your entries if the “Close” button. Tap the “Save”, please save your post. 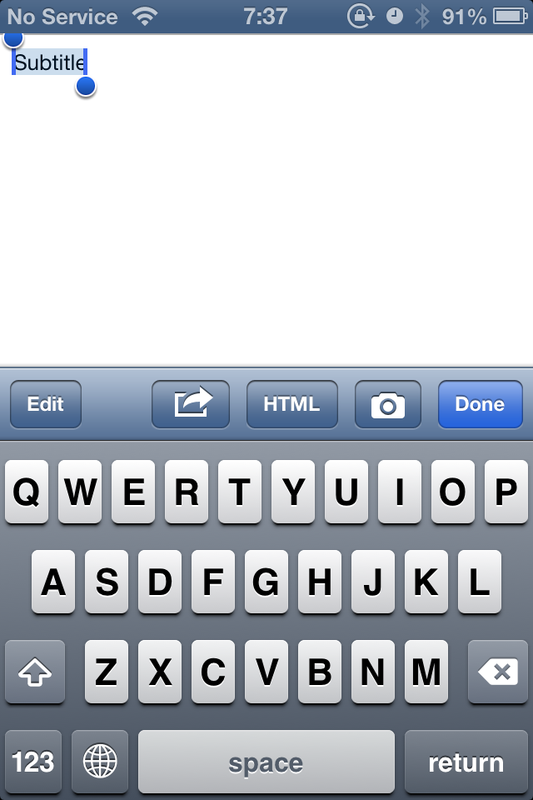 The following keyboard accessory button appears when you select the body text box. 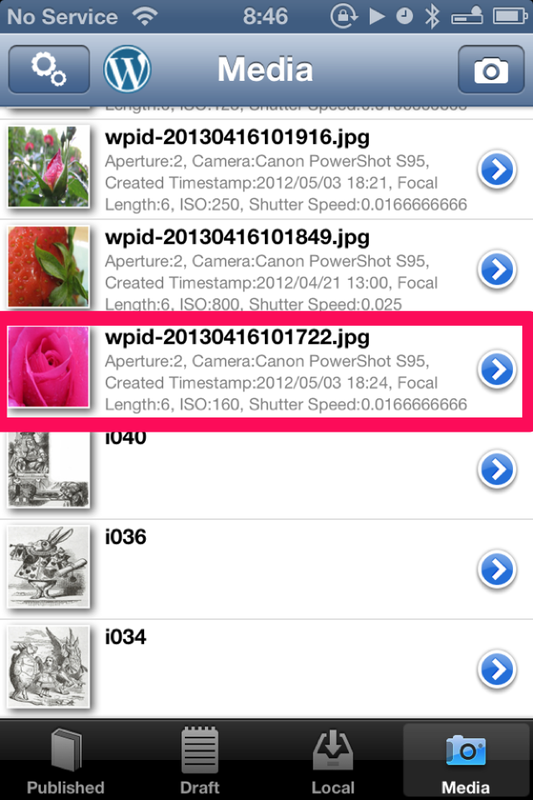 If you tap the “Camera” button, the action sheet is displayed for selection or from the local photo library or media. Please tap the “Local Library” to upload a new photo. 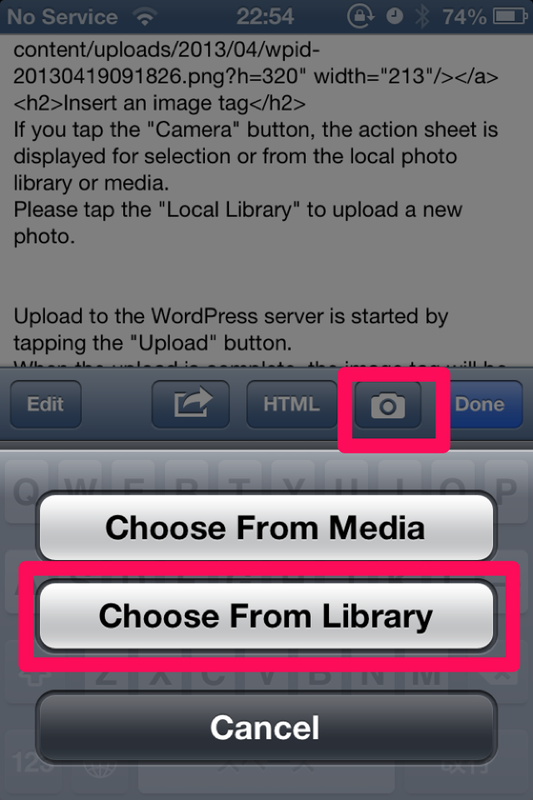 Upload to the WordPress server is started by tapping the “Upload” button. 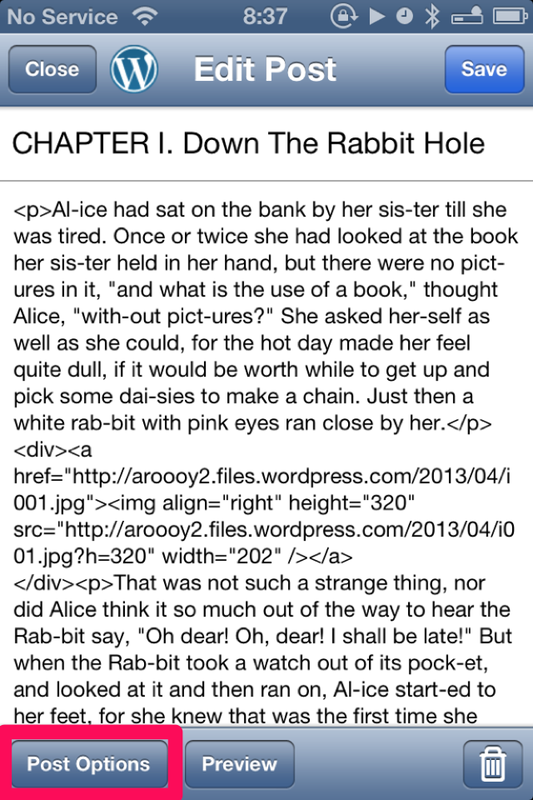 When the upload is complete, the image tag will be inserted into the text box. If the “immediate upload” in the account settings are set to Off, the provisional image tag will be inserted in the text box. In this case, when the post is made, uploading is performed in a continuous provisional image tag. Please tap the “Media” to insert an already uploaded photos. 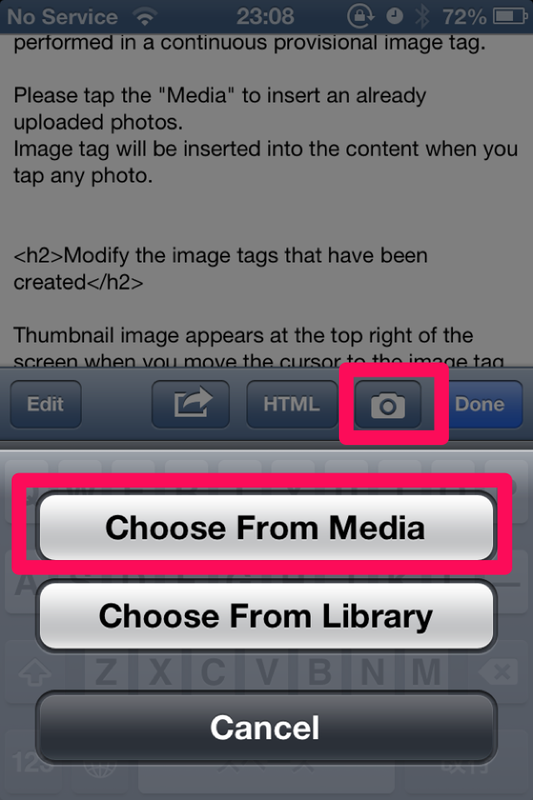 Image tag will be inserted into the content when you tap any photo. Thumbnail image appears at the top right of the screen when you move the cursor to the image tag. 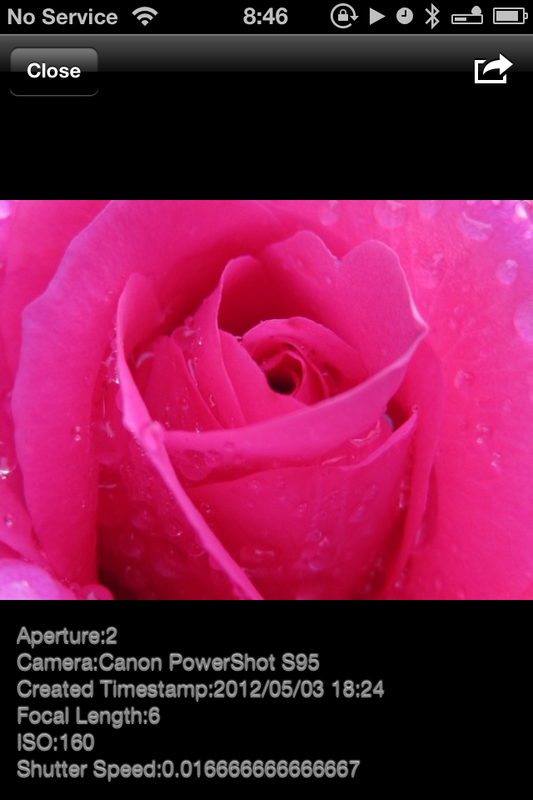 Image tag edit screen to start and tap it. Please tap the “Set” button to do any input each item. 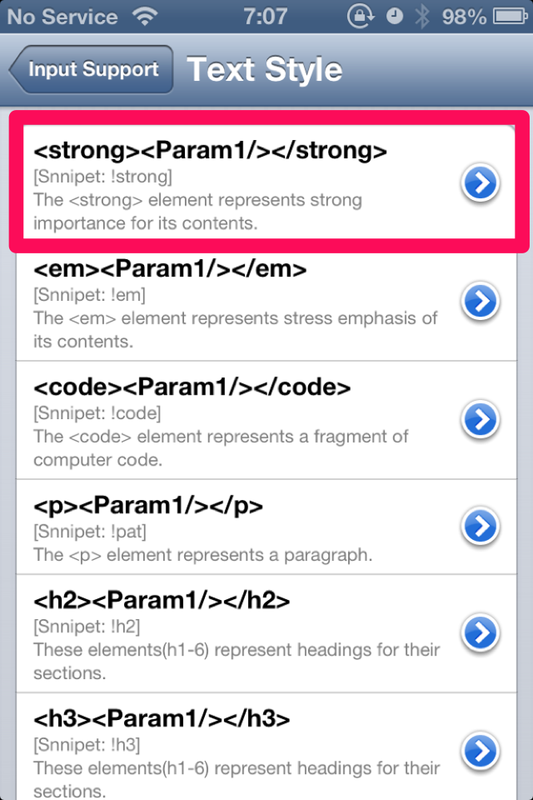 PressSync has a support function for inputting the HTML. 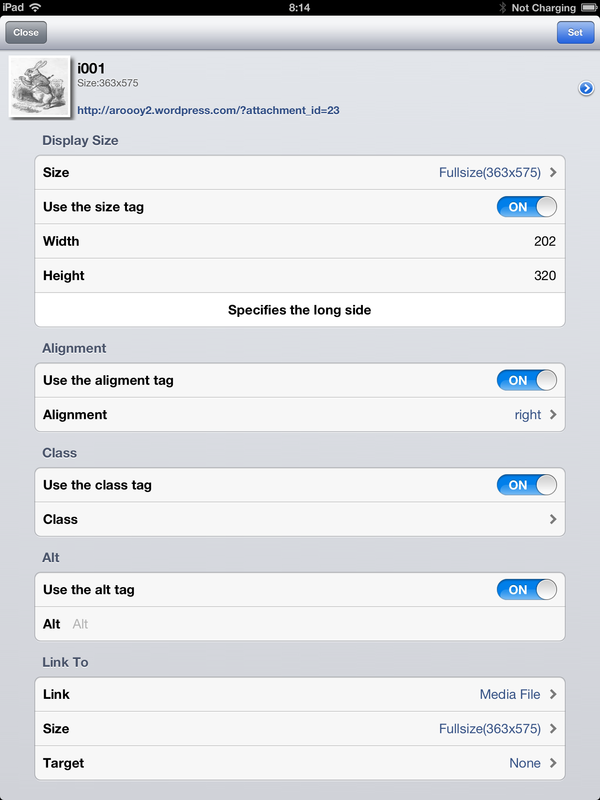 The most basic purpose of this feature is to enter the template text. The template text up to three parameters are set. Such template text output can dynamically change the portion of the template text. And therefore, Template with a single parameter, all parameters are set when called. So, you may think that the static template is used. But, please do not forget. The built-in templates for most, that has only one parameter. Template text that has two or more parameters, a parameter input screen starts. When you select the “strong” in the state in the image below, will be inserted with the text selection has been sandwiched. When you select the “href” in the state of the image below, the parameter input screen will be launched. 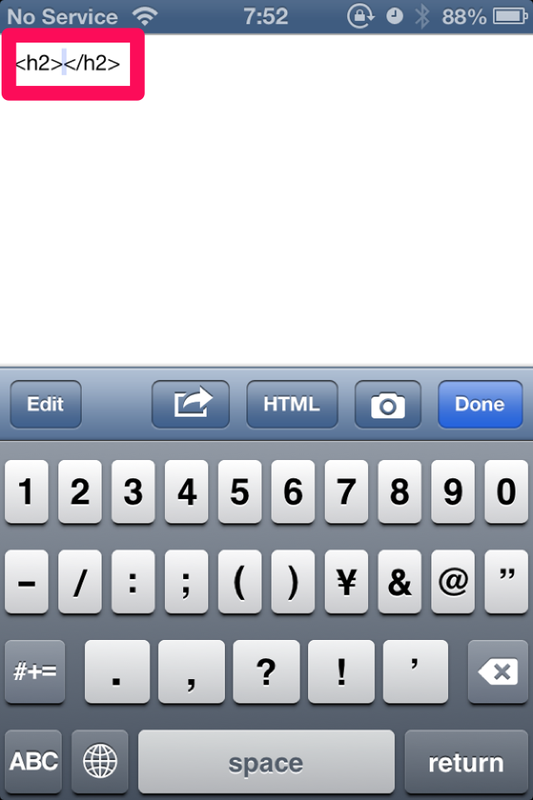 Please tap “Ok” and then enter the URL of your choice. Assembled text will be inserted. 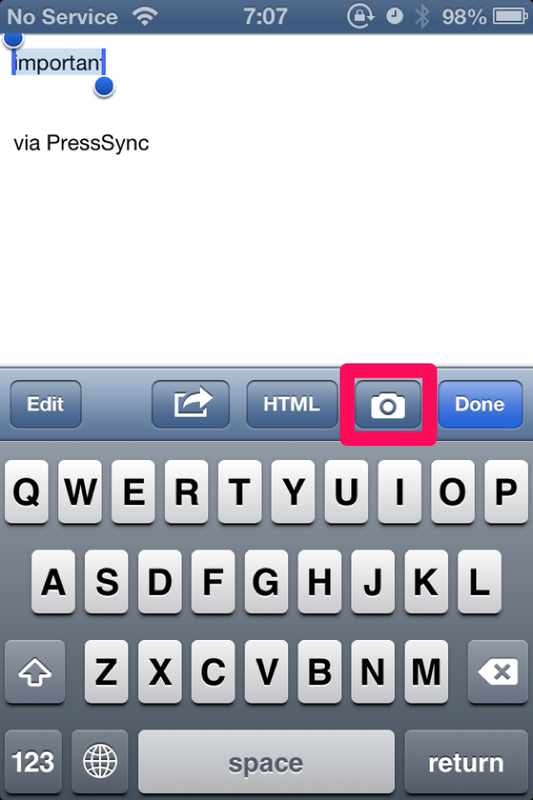 Screen “Input Support” Tap to launch the “HTML” button. Please select any of the items on this screen. You can directly call any template by entering the snippet. 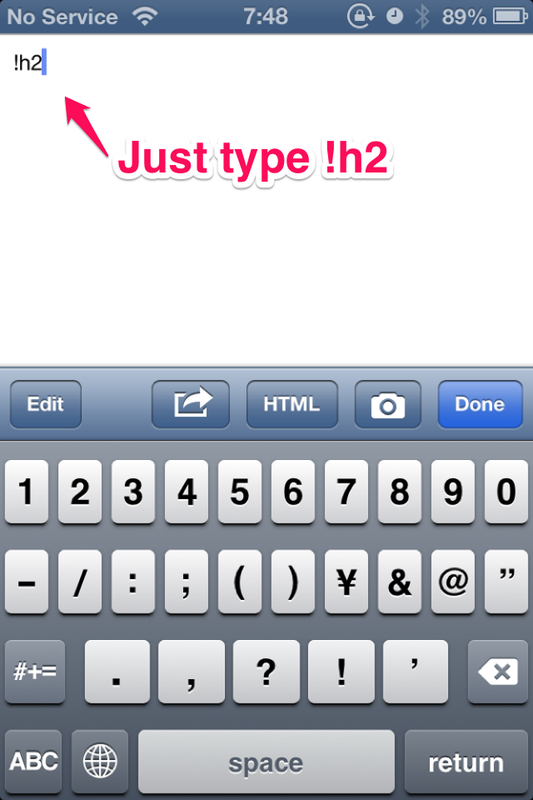 Please type “!H2” in the state you have selected the text. 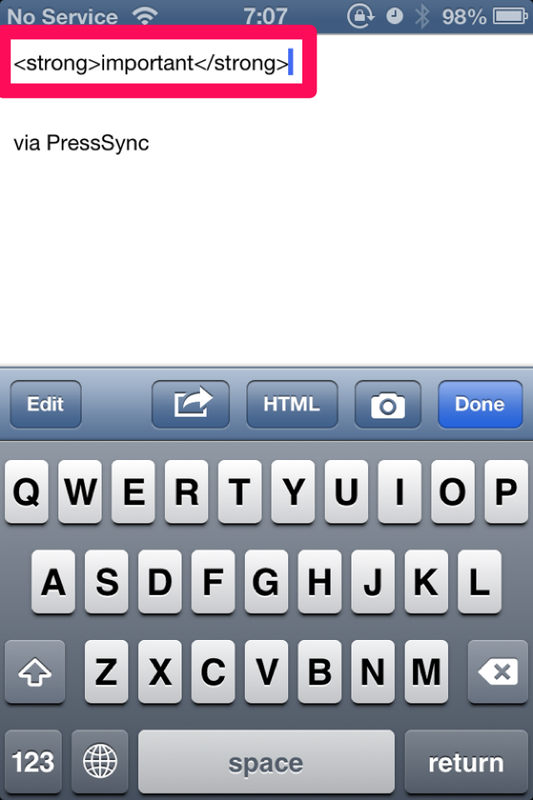 Hello, PressSync is a very impressive app. I like to have the paid version but there is a vital feature to mr that I think is missing. See when I insert image from media, even though it has caption written, the code pasted to the editor doesn’t have the input which makes the photo has no caption when it published. 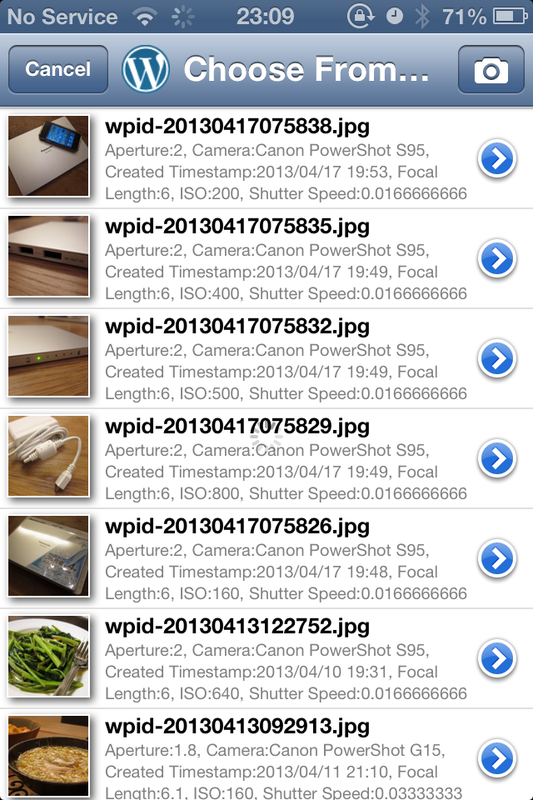 Also it will be a nice feature if you I can edit the photo information e.g. 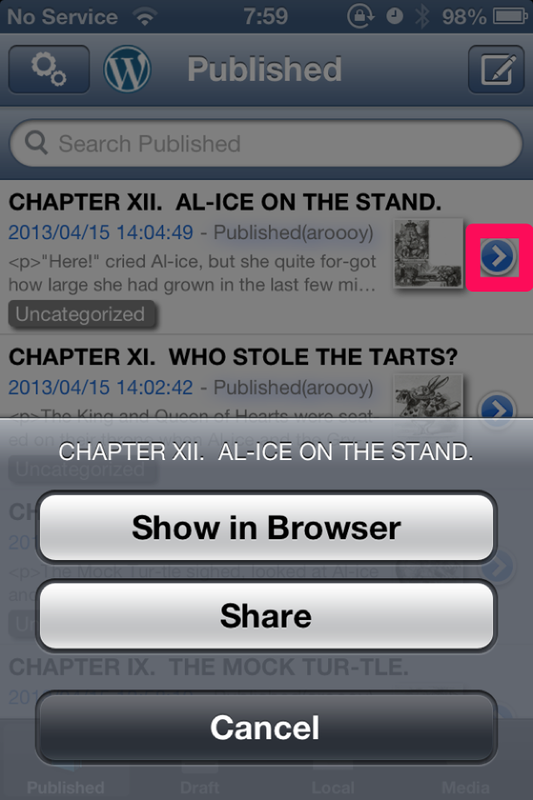 in the library directly from this app. I notice we can do some properties adjustment from the editor when we insert the cursor into the image code but no caption enable button is there. Perhaps I missed something here please advise. Thanks. You’re saying the “Caption”, what things Alt tag or Title tag? If you want to automatically insert the Title tag to the media selected, from the default media section of the Account Settings screen, please set to On the Title switch. It is not possible for the API of WordPress does not support editing of Media library directly from PressSync. API is also supported PressSync soon support. Thank you for your opinions. We have just downloaded your latest App (iOS) and are unable to login to our WP site. We are only having this problem on phones where we have a fresh install of the App. On phones where the App was already installed we have had no issues. On Friday I showed your App to a client (Who paid for the full version) and she had the same problem. Here is the error message we keep getting. This is on 3 different iPhones. In the case of self-hosted WordPress, version 3.5 or higher is required PressSync. An error has occurred in the “GetUserBlogs” method showed that I see your error content, this method is a method that is supported from WordPress3.5. You please check the version of WordPress you are using. I’m using a self hosted version of WordPress 3.8.3, the point is it was working fine on the same site before the latest update to your APP. My client purchased your APP and it doesn’t work, can you please fix this issue ASAP. I found a bug that will not start up in iOS5. Today, I have to apply to Apple’s modified version. Please wait until it is released. Thank you download the app. I think internal error as has occurred on the server side. Sorry, would you check the error of WordPress server-side of you? PressSync supports the version 3.5 or later, it seems that it is available in your environment. I just purchased the paid version. Olympia.gr is hosted on wordpress.com. 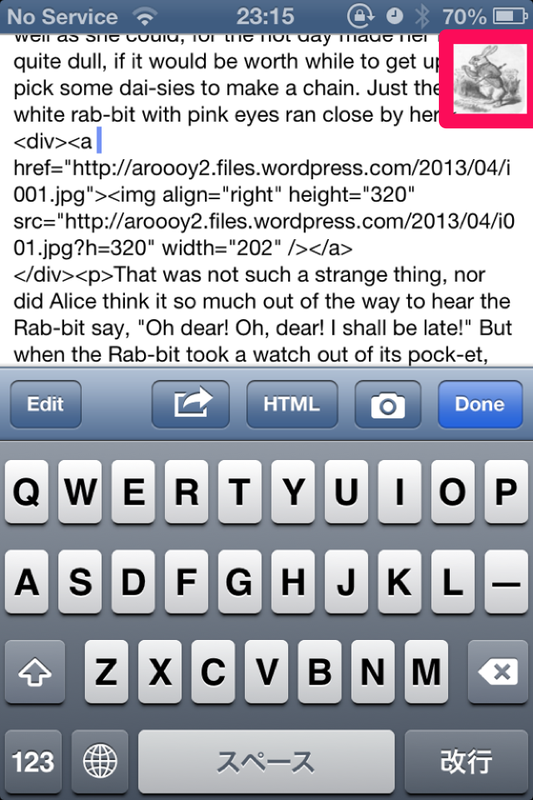 The posts never appear on the blog, not even saved as drafts. They also disappear from the app after publishing. Please fix it. Recheck and show that draft posts are posted on a date of 1970, this is why they do not appear. Even if I schedule d&t, they just take this date (1970) and disappear. Please do something. I’m sorry reply is late. API behavior of WordPress.com changes without announcement, this failure has occurred. Today, I have to apply to Apple’s modified version. Please wait until release. For the Events, how come there is no date / time field for the events? It just selects the current time and posts it. I purchased the pro version because it stated there were more options but this is missing. Not any use to me without this feature. Please add it. If you want to post at the current time, then please post be set to Off the [Specify the DateTine]. It will only use currant time. There is no place / setting to set the Events time or date. You only have a post time and date option which is of no use what so ever. I am sorry. I do not understand the meaning that you said. There is no item “Event Date” in the post of WordPress. Do you thing of the custom field? There is no option to post the date of the event? You only have the ability to tell it when to post. So when I post to my “all in one event calendar” by WordPress using your app there is no option to give the event a time or date. This is the only reason I purchased the pro version. I will contact apple to have the money refunded. Hi aroooy, thank you for this full-featured cool app! I just became a PressSync Pro user and threw the official one aside. [Blog URL] to Could you enter the URI of xmlrpc.php directly? PressSync Where can have relatively determine the path of xmlrpc.php from blog URL, I seem to the process is not running well. Hi. I get an error when I try to publish a post. I can delete posts and I can see all posts. Error. Server return a fault exeption. 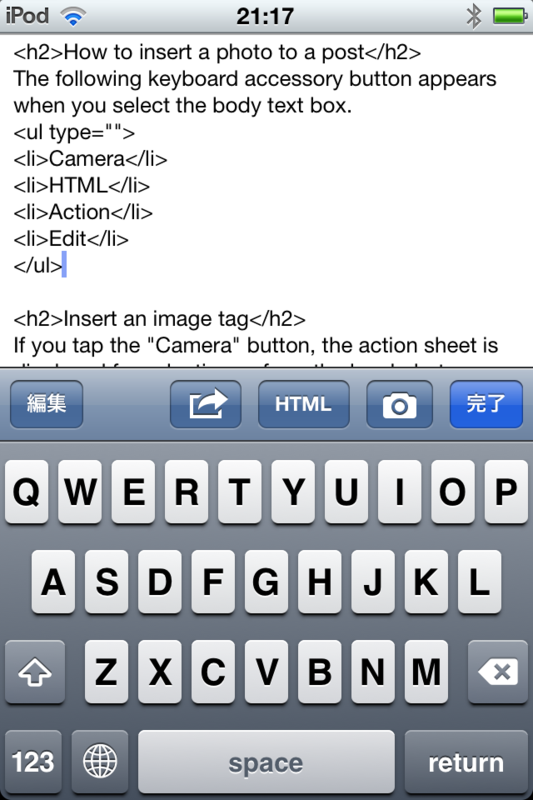 It works with other Iphone editors, example wordpress own editor. Hello. Thank you for using PressSync. Please refer to the next page. It is probably because the category is not synchronized. Thanks for your app. I bought the pro version. When travelling I often have no WiFi or 3G. But I take a lot of pictures that I want to post and comment. And later when I have internet access, I want to synchronise it with my wordpress site. 1) since I have many pictures, could you make a multi select option to select many pictures at once and “import” them into the blog? Would simplify the writing. 2) when the internet speed wasn’t very good, I saw that it took many attempts to upload, while reloading again the picture. Would it possible to kind of buffer it on the server so it not needed to start again? Just to be sure: is possible to preview the pictures instead of the link? I used the same during the trip so I thought about the same thing as you. Especially I thought that I needed a multiple upload of images. However, it was difficult to realize it with my development skills. I will challenge the implementation of this feature again. 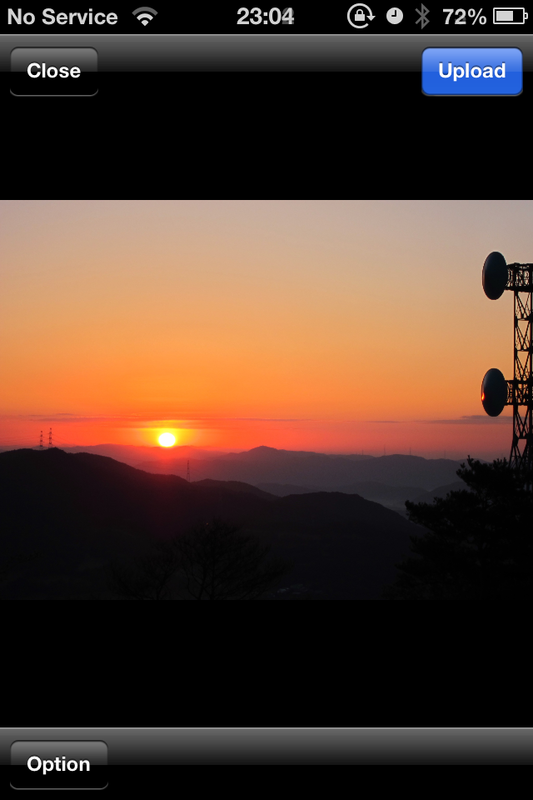 Thank you for your opinion on data communication savings. I am going to use it as an example. hey i jus paid and downloaded pressSync pro and i can’t log in. It keeps showing me an error message. I am so disappointed! Thank you for buying the app. I think that this site will be helpful. I think that it is probably a security problem of your server.